“Hey Amber, look at the size of that one,” my father says as he enters my kitchen, rolling a small stone from his hand onto the kitchen table. It’s still wet and I hope that it’s water and not pee. My father is very proud of his kidney stones and he has just passed his 7th at my house. I wave him away, overcome with the urge to clean my table. I grab a kitchen wipe to sanitize the surface as he removes the stone, picking it back up into his palm. Even if the liquid that remains is only water, I know he didn’t wash the stone with soap since he rarely uses the substance for anything. At this moment, I can not appreciate the strange thing my father just presented to me. He is so proud of his kidney stones that it’s one of the first things he shares with people. At home each one is kept in it’s old dusty film canister, labeled with the date and place where it was passed. If he passes one when he’s on the road, like he just did. He travels with it on his person at all times, awaiting the opportunity to take it out and share it with his new audience. My father takes great pride in what his body makes, in his children and in the more unusual and uncelebrated articles. My father has passed 9 kidney stones since the mid 1980s. He lost one in his divorce from my mother 1990 (My mother threw it out.) One was lost down the urinal drain in Walmart, Fayetteville Arkansas in 2013. (Now he only pees through a strainer.) 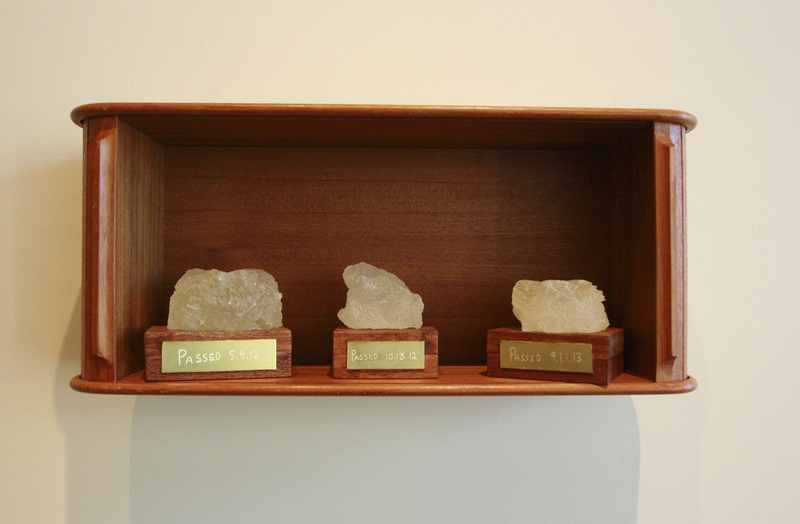 And one and ½ stones was sacrificed for analyzation this year by doctor’s orders. 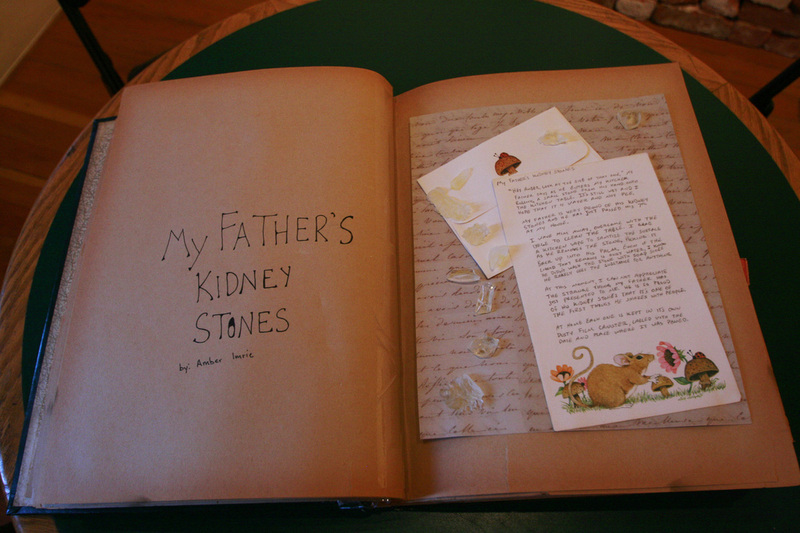 For those lost kidney stones I have made my father trophies to celebrate his accomplishments in their passing.